This collection has been arranged chronologically except for several non-correspondence items that are attached at the end. Craig Atmore (1875-1933), son of a Philadelphia business family with English roots, attended Penn in 1891 and graduated with a B.S. from Wharton in 1895. Craig succeeded his father in 1908 as president of a family company manufacturing mincemeat. He was vestryman in St. Stephen’s Protestant Episcopal Church and also a member of the Manufacturers and Bankers Club. The Atmores first lived in North Broad Street and later moved to Wayne, a Philadelphia suburb. Kenjiro Matsumoto (1870-1963) and Seizaburo Yasukawa (1877-1936) were brothers from a Japanese samurai family that rose in the Meiji restoration period. They bore different family names due to Matsumoto’s adoption in his early years by a relative, also a Penn alumnus. Matsumoto registered for the Towne Scientific School in 1891, the same year Atmore was enrolled. Matsumoto, however, cut off his study at Penn due to the need of his family in Japan in 1893. Seizaburo Yasukawa was enrolled at Penn in 1896 and graduated with B.S. in 1900. Matsumoto’s early experience at Penn brought the three Penn alumni together. Lonely and far away from home, Matsumoto joined the fraternity Phi-Delta-Zeta and stayed in its dormitory for three months. Later, his classmate Craig Atmore, concerned about his condition as a foreign student, invited Kenjiro to his home for room and board. 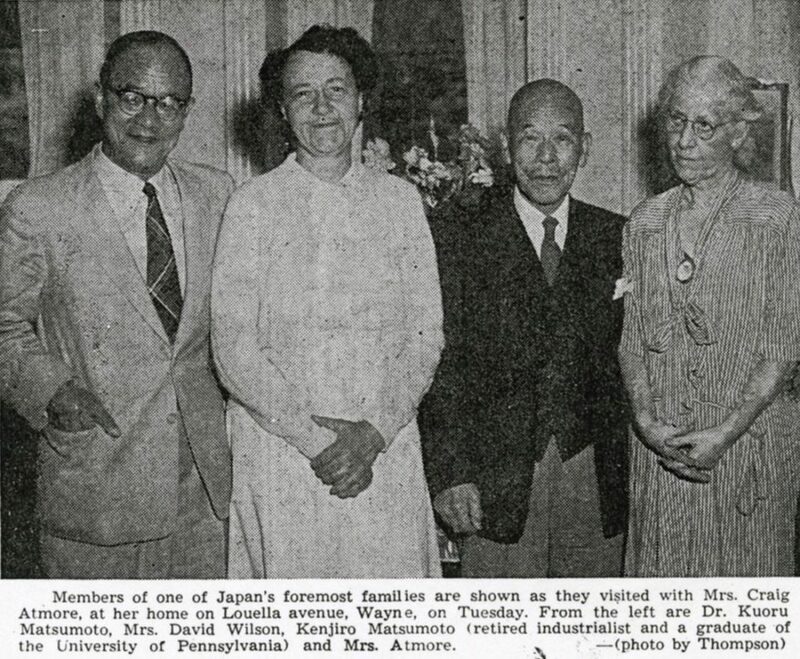 The Atmore family treated the Japanese student so kindly that over time Kenjiro Matsumoto became just like a member of the Atmore family. Soon after Kenjiro’s return to Japan, his brother Seizaburo came to Penn. Upon his arrival in Philadelphia, Seizaburo settled with the Atmores to learn English. After he was enrolled at Wharton, he visited the family frequently and stayed for weekends with Craig. The two Japanese students’ experiences at Penn turned out to be the beginning of a century-long warm friendship between the two families. Keiichiro Yasukawa, father of the Japanese family, met and extended thanks to the Atmores during his visit to the U.S. in 1911, which was followed by the visit of another brother Daigoro Yasukawa in 1914. The Matsumoto-Yasukawa family began in the coal mining business, but later expanded to cotton industry, steel, and electric machinery. Kenjiro, Seizaburo and Daigoro achieved great success in business in Japan. They founded a Yasukawa-Matsumoto partnership in 1935. 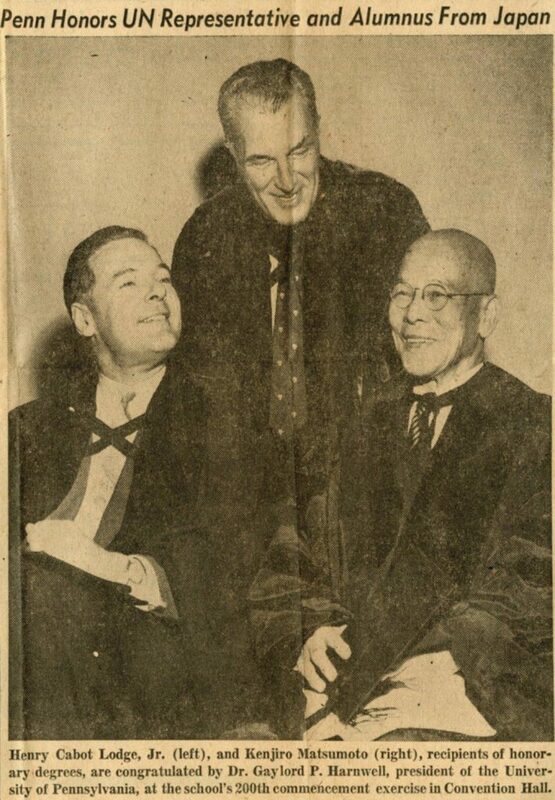 Although Craig Atmore died unexpectedly in 1933, and Seizaburo Yasukawa followed in 1936, the friendship forged by the three Penn alumni continued between the two families through exchanges of correspondence and visits. Invited by Kenjiro, Craig’s wife Emma and her daughter Virginia visited Japan in the fall of 1935. They stayed in Japan for three months, including five weeks living with the Japanese family. Craig’s son Robert visited Japan the next summer. World War II interrupted the exchanges between the two families. Communications, however, were restored soon after the war ended. As a staff of the American Red Cross, Robert Atmore came to Japan with the U.S. Army from the South Sea Islands in the fall of 1945. He was delighted to locate Kenjiro amid Tokyo’s war ruins and thus resumed the friendship between the two families. In the early 1950s, at the initiative of Robert and his sister Ede, the two families started to collect data to trace the development of their friendship despite war and cultural differences. In 1956, Penn awarded Kenjiro Matsumoto an honorary degree in its 200th commencement. This small collection of correspondence records the international and inter-cultural relationship between the two families – the Atmores in Philadelphia and the Matsumoto-Yasukawa family in Japan. The collection consists mostly of letters, which are all coded by the donor, the descendents of the Atmore family. Apparently for a better understanding of the backgrounds, the collection has also included two family charts of the Japanese family, an autobiography of Kenjiro Matsumoto, a chronicle of Seizaburo Yasukawa’s life experience, a reminiscent account by Emma Atmore of the history of the friendship between the two families including her visit to Japan in 1935, and a book in Japanese tracing the rise and development of the Matsumoto-Yasukawa family in Japan. For the convenience of researchers, a list of original code index has been preserved with errors marked and corrected in pencil. #16, Craig to Sabro Yasukawa, 1929 Nov. 10, condolences on Michiko, etc.